Is only Peking Duck skin served? 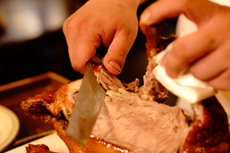 Many people believe that eating Peking Duck means tasting only its thin-sliced skin. 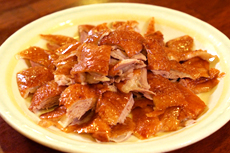 But in Beijing, the home of the Duck, it is common to taste thick meat. Chinese cafe Eight also gives you this experience. What is Peking Duck like? 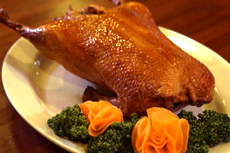 Peking (=Beijing) Duck is a representative Chinese dish, which roasts a whole seasoned duck. The fattier the duck is, the tastier it becomes. That is the reason only a Peking duck and its improved breeds will be used to prepare the dish. The way to eat Peking Duck is different depending on the regions, such as putting it between slices of bread or rolling it in thin crust. In our restaurant, you can experience the Beijing style, wrapping the duck slice in thin steamed pancakes called Kao Ya Bing (烤鸭饼). 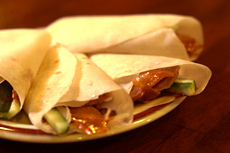 In China, Peking Duck is not always considered as an expensive dish. People enjoy eating it casually, but with a luxurious feeling. Generally a duck, including Peking duck, is considered being good for health and beauty. A duck contains vitamin A, vitamin B2, collagen, potassium, calcium, iron etc. 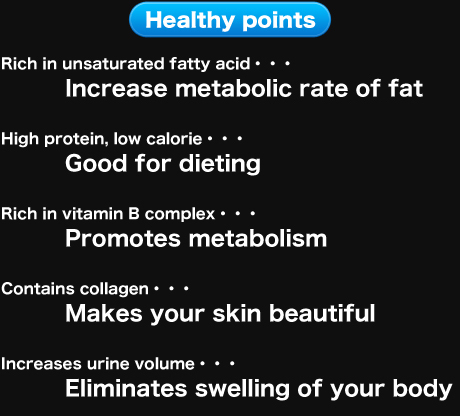 It also has an effect of beautifying your skin because it promotes metabolism of fat. Some women are not willing to eat fatty things…but it is good for people who are on a diet because duck’s fat never be absorbed into human body! 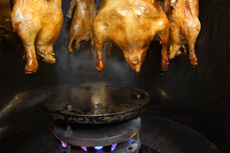 First, we serve a whole roasted Peking Duck in front of your table. 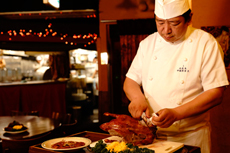 And our chef gives you a higher enthusiasm for his next performance―carving the duck. Please feel free to take pictures, as if you are making a trip abroad. Peking duck entertains you in many ways―It is a feast for your eyes, an enjoyment for your tongue and a treasure for your health. We spend two whole days to prepare for seasoning the ducks. After that the duck will be kindly prepared in an exclusive oven. This is how a mouth-watering thick slice of the duck will come to your table! The rest of its meat and bone is also served as stir-fried dish and stock soup. If you come here with 3-4 friends, you can enjoy all these dishes as a main course. Experience the best Peking Duck with us. Even people from China were impressed by our duck!